One of my most popular, quilt tutorials: an easy, fast, beginner-friendly Fast Four-patch baby quilt. Pefect for a scrappy look and showing-off cute fabric. It’s a great project for new quilters. If you are brand-new to quilting, besure to check out my Beginning Quilting series for all the basics on supplies, cutting, piecing, and quilting! This is one of my favorite go-to quilt patterns for a quick baby quilt. It works really well to show off a main ‘focus’ print contrasting with a variety of prints in scrappy four-patch blocks. The quilt shown here finishes at 40″ x 56″. I have fabric requirements, cutting and pieceing instructions for Throw, Twin, Queen and King sizes below. If you would prefer a printable PDF version of this pattern you can find one here. Sub cut into 17 squares 8 1/2″ x 8 1/2″. Match 72 squares up into contrasting pairs. Sew squares together using a 1/4″ seam. You can ‘chain’ them through quickly without even cutting the thread. Press seam to one side. Match each pair with a contrasting pair and sew together to create 18 four-patch blocks. Press seam to one side. These blocks should come out as 8 1/2″ x 8 1/2″ unfinished. Sew squares into rows, pressing seams toward the 8 1/2″ square blocks. This will create nesting seams when you go to sew the rows together and make the assembly much easier as well as matching up points. Sew rows together and press seams all the same direction. Layer quilt top with batting and backing and baste together. Quilt as desired. I pieced my back using prints from the collection. I had fun showing off some of the focus prints on the back and adding the Swiss dot in Navy worked so well as the binding. Yum. Quilting by Sew Shabby Quilting. For Binding sew 2 1/2″ x wof strips end to end. Binding tutorial here. And voila! A super quick – and very cute – crib quilt! Here is a previous version of this simple quilt design. It’s a great one for using up fabric and showing off fun prints. You can order prints from the Trendsetter collection from The Little Fabric Shop. Make 32 total four-patch blocks. Lay out quilt rows 7 squares across by 9 rows down, alternating focus fabric and four-patch blocks. Make 55 total four-patch blocks. Lay out quilt rows 10 squares across by 11 rows down alternating focus fabric and four-patch blocks. Make 113 four-patch blocks. Lay out quilt rows 15 squares by 15 squares alternating focus fabric and four-patch blocks. If you would like a printable PDF version of this pattern you can find it here for $2.50. Beautiful quilt! Love the colors your chose! Great fun quilt! Yes, this color pallet is wonderful. Ammy, I love your choice. These quilts are really wonderful , it&#39;s fabric is beautiful as well as designs are very nice. I have a question, I have a yard of main fabric I want to use, if I were to order a 1/4 of a years more in order to have enough to do this quilt would that totally screw me up? This is my first quilt so it’s probably a silly question. Thanks! I would say, just to be on the safe side, order more than the 1/4 yard you are missing. I would go for at least 1/2 yard. And good luck with your first quilt! cot , single , king single , double , queen king. I’m guessing it’s the equivalent. I don’t know the measurements of a single, but I’m sure they’re very similar. Wondering if the King size requirements are correct. How can the double/queen be 3 1/2 yards of focus fabric and the king size require double that? Thanks for your question. I went back and checked my math. I was off slightly and have updated the measurements. But still, that King size is almost double the Queen requirements. Those King-size quilts are just exponentially bigger. It’s crazy. I’m making a king-size quilt for my husband for Christmas who is a retired vet, I need a quick and easy process to finish the back of the quilt can you help me ? Thank you for making this pattern available free. baby colour maybe adding embroidery/applique. Love the tutorial. I’ve not done to much quilting but like to do embroidery. Your directions are very clear and anxious to try this! Thank you. I have a question about the quilting. What color thread was used for quilting the three pieces together? I’m making this quilt with different fabric but since there are so many colors I’m not sure what color to use when quilting. I just had the quilter use a cream/neutral thread that would blend with most of the prints. There seems to be a little something off with the measurements — after sewing the 4.5″ squares with the .25″ seam, they won’t match the 8.5″ blocks anymore like in the pictures, but rather be off by .25″. Were either of the squares cut to different dimensions, perhaps? Hmm. I’m sure that’s right. Because four 4″ x 4″ squares (finished) will create an 8″x 8″ finished block. So unfinshed the blocks would be 4.5″ and 8.5″. Check your seam allowance. Even if it’s only slightly bigger than a 1/4″, it could skew things and the block will end up slightly smaller. Let me know. I had the same issue Michelle. I just used the “square up” method to get all my blocks to be the same sizes. What is the square by row layout for the twin quilt? Second quilt so still a beginner. Really excited to try this quilt. Layout blocks 8 blocks across by 11 rows down. Thanks so much for these easy to follow instructions. I’d purchased some fabric quite some time ago and didn’t have a project in mind only that it was going to be some sort of patchwork. This is my first ever quilt, I started making it today and it’s looking fabulous so far! Awesome! I’m so glad to hear! I hope you’ll enjoy it. Will this quilt look ok with a few random small squares of another fabric that goes well with the others. I am not sure I have enough of the 13 that I need, they cut my pieces too small when I bought them. Thank you. Hi! I am so excited to try this pattern, in a twin size, but I can’t figure out how to cut the focus fabric. At 1 3/4 yds, 44 in wide, I can only get 35 8/5″ squares out of it. I’m not sure what I’m doing wrong. Any help would be appreciated! Ahh! You’re right. There’s a typo – should say 2 3/4 yards. THanks for the heads up! I’ll fix it right now! This was my first quilt EVER and now I’m totally quilt crazy. I made a lovely pink quilt for my granddaughter for Christmas and she and her parents love it. Thank you for your great instructions! Some of terms used for fabric are confusing to me. For instance, what is a “layer cake”? Hello! I am hoping to try this pattern out for my first quilt. I see these really cute Fat Quarter fabrics at JoAnn and was wondering if those would work ok for the four-square patches? I’m not sure how many “Fat Quarters” I would need to equal 1/8 yard. Any help would be appreciated. Good question- you can get 16 4 1/2″ squares from 1 Fat Quarter. So if you are making the crib size quilt, you would need at least 5 Fat Quarters. Could you tell me the dimensions of each block for the backing? I’m trying to mimic your design with the fabrics I picked out and would like to know dimensions for each block. I know it’s 40 inches across for each fabric. Just making sure I understand your question – do you mean the 4-patch block measurements? They should measure 8″ x 8″ finished (8 1/2″ x 8 1/2″ unfinished.) Let me know if that is not the information you are looking for. Just made this quilt using the new Star Wars fabric as the focus piece with contrasting 4 patch. It came out beautiful. I made the twin size and the directions were easy to follow and accurate. Now I’m making a double size with John Deere fabric as the focus. Love this pattern. Those sound awesome! I’m glad the directions were helpful! I’m having trouble getting you links to social media working. Thank you SO much for letting me know! I think I’ve fixed them. I didn’t realize they weren’t working so I really appreciate the time you took to tell me! If the fabric store cuts exactly 1/4 yard and their cut is off- it doesn’t leave you with enough fabric. Just an FYI. I couldn’t figure out what I had done wrong until I realized that’s what happened. I’m going to add a border so it will work out to be a twin size quilt. Might want to get a 1/2 yard of each fabric instead. Oh, I hate when that happens. 🙁 Good solution though and thanks for the suggestion. I am wanting to make a wheelchair blanket and have told 36×36”, so 4.5 x 8” finished block so have 2 x 1 mini squares rather than them made into 2×2 blocks. Do you think it would work? Sure. Or to make it even easier, do a quilt that is 32″ x 32″ and then add a 2″ border (cut 2 1/2″ strips) and then you’ll have 36″ x 36″. I love this quilt! I need to make a crib quilt for my son, how could I adjust this for crib quilt dimensions? The quilt as demo’d is close to a crib size quilt at 40″ x 56″. If you want slightly bigger, I suggest graph paper and sketch it out in the finished size you’re aiming for, and then add the additional blocks. Amy, I’m a new quilter…I have some precut fabric squares that are 5×5 and 10×10. What are the dimensions of the big square? I know I’ll have to trim my 10×10 squares but want to make sure of the measurements. I’m late tho the party but had a lot of fun using this pattern idea! Amy, I have my fabric on order and can’t wait to get started on this beautiful quilt. I have made four quilts so far, but all have been crib size. You are so easy to follow! Thank you for sharing! I have 4 prints and they are 1/2yd each will that be enough for this quilt to make for a baby? Hi. I am wanting to use this pattern to make a lap blanket. What would I need? I have not made a quilt yet, this one looks like a good candidate for my first try! I am not understanding how I would use the 10 strips as the border for the King size… Would i sew 2 sets of 2 of them together, ending up with two 84″ strips, would those be the border of one set of edges, and then sew the other 2 sets of 3 of them together, ending up with two 126″ strips, which would be the border for the opposite set of edges?? HELP! This quilt is beautiful and I want to try this as my first quilt, making it for an elderly nursing home patient but can you tell me how to make it throw size? How many blocks and how many rows across the top and down? Hi Sabrina! I finally updated the tutorial to include a Throw Size (56″ x 72″) variation. I am so excited, not only have I found a tutorial I understand in an effort to try my hand at quilting (first time quilter, long time pinner) but you actually still respond to questions from your followers. THANK YOU! Look for lots to come your way. Thanks, Marnie! I hope you have fun with your quilt! Quilters, I have a question about how to deal with the back side of this quilt. I’m getting ready to cut some of the fabric that I plan to use on both the front and back, and I realize that I failed to consider how making a larger version of this quilt would affect the back. 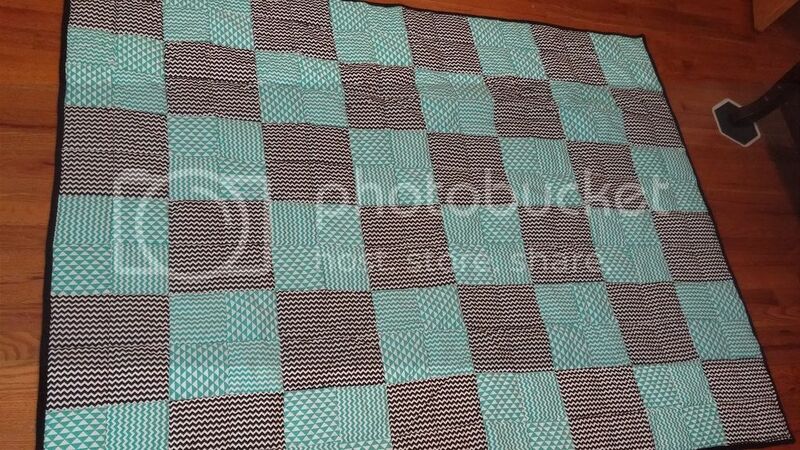 One of the pictures shows the back with five wide strips of fabric that span the whole width of the quilt (11th picture down from the top of the page.) Those are solid pieces of fabric, right? HOWEVER, I’m making the double/queen size (80″ x 88″), so my fabric will not be wide enough to be solid strips. Oops! BTW, I plan to use only 3 different fabrics on the back rather than five: 1 yard of one, 3 yards of another, and 2 yards of a third. What would the measurements for a throw size quilt be? Yes, you need a total of 220 4.5 x 4.5 squares. You’ll sew those together to make 55 4-patch blocks. I’m making this in the twin size (first quilt! ), but I’m stumped on the backing. I got 5 yds of the fabric for the backing and have measured multiple times but just can’t seem to figure out the layout for it. Any tips or tricks? So, I always go back and forth about telling people how much fabric to buy for backing – whether to buy a lot so it’s only one seam to piece a back, and then have a lot left over, or as little as possible, which might involve more piecing. Here’s how I would piece this one: Cut into two 2 1/2 Yard (90″) pieces and sew together side by side. This will create a 80″ x 90″ piece of backing. (If the background print is not directional) you could trim 7″ off one side and sew it to the bottom of the backing, making it 73″ x 97″ so that you have more space on all sides to make quilting easier. I hope that helps! Thanks so much for your question. I did change the backing yardage to 5 1/2 yards just to eliminate the extra piecing. Thank you so much for the beautiful pattern, also I love how you also provided the instructions for other sizes, that was very helpful!!! Sorry I’m so slow getting back to you on this. :/ If you cut 4 1/2″ wide strips of fabric, then you can cut them into squares much more quickly. I hope that helps! Hi Amy – I’m new at quilting but have been a sewer for 50 years. Do quilts work well with flannel fabric? I want to try this pattern with some I got on sale? Thanks for the tutorial. Yes! Quilts made with flannels are wonderful! This pattern would work great with flannel fabric. Just make fewer blocks/squares. The blocks are 8″ x 8″. Using that number, decide how big you want your baby quilt to finish. Graph paper or sketching it out will make it easy to customize it to whatever size you want. I plan to use fabric from “old” flannel shirts my husband wore for work. I’ve read that I should apply iron on interfacing to the fabric to keep it from stretching. Do you think I should do this before I piece them together or after I’ve made the blocks? Also, I am wondering about using the fleece fabric for the backing. Is it a good idea to mix fabrics? Thanks! Definitely apply the interfacting before you piece them together. If possible, I would apply the iron on interfacting, where possible, before you even cut the squares. It will give them stability and help them keep their shape – it will make it SO much easier to bot cut AND sew them together. I’ve never personally used fleece for a quilt back. My only hesitation is if the shirts are all cotton and the fleece is polyester, the cotton parts could shrink differently, but where these are shirts that have probably been washed dozens of times already 😉 I think you’ll be safe. I would try googling it to see if someone talks about using fleece as a quilt back, just to be safe. New to quiliting – I am making a king size quilt – I am wanting to make the 4 patch with borders. what size do i need to cut my squares? I would like to make this quilt for my daughter. She has a full sized bed and I don’t know how much material I would need. Could you please help me? I have a question. I just cut 80 five inch squares. Do you know what size I would cut the larger middle squares if I sewed the 5″ squares together for the quad?? Cut the larger squares 9 1/2″ x 9 1/2″. Help! I cut my small squares 4 1/2″ X 4 1/2″ and when I sewed them together with 1/4″ seams, the resulting squares are 8″ X 8″ and don’t match up to the bigger 8 1/2″ squares. Have I made a mistake? Hmm. Without looking at them, my guess is your seam allowance is a little wider than 1/4″. A scant 1/4″ will help your squares end up at 8 1/2″ x 8 1/2″. You were exactly right! Either it’s off on my sewing machine or I don’t know how to use it. My seams were all just a little too big. I reviewed your tutorial and will get it right next time. I just trimmed down all my blocks and carried on. I finished binding it today and now my first quilt is in the books. Thanks for sharing these instructions. The squares are 8″ x 8″ finished in the quilt (that’s what you will get when you combine 4 finished 4″ x 4″ squares) but to allow for the seam allowance, cut them 8 1/2″ x 8 1/2″. If your four 4″ x 4″ squares sewn together are coming out smaller than 8 1/2″ x 8 1/2″ (before they’re pieced into the quilt), check the seam allowance. And, if you’ve already sewn together all of your 4-patch blocks and they’re coming out smaller than 8 1/2″ x 8 1/2″, then yes, square them down to the smaller size. Absolutely lovely! Thank you from us visual learners for all of the pictures. New to quilting at 63 and sorry I waited so long.